CWD is strongly committed to sustainable development. It also looks to the future, concerned for tomorrow’s world, and make every effort to limit the impact of its activity on the environment. You may already be familiar with some of our environmental initiatives, namely our vegetal-tanned leather and our eco-design saddle packaging. Keep reading to discover how we recycle the tarpaulins from our stands into fashionable, practical bags for protecting your riding tack. Every year, CWD participates in numerous salons and competitions around the globe. Where possible, we re-use the materials employed for decorating our stands. However, certain events and new products require us to print new tarpaulins. In total, that’s about 1,600 m2 of tarpaulin per year. The tarpaulins we print on in France (via our own printers near Nontron, in the Dordogne) are made of PVC We decided to recycle them, where possible, so we’ve started making them into bags to hold your girths, boots, bridles and other small tack. So far, 2,500 bags have already been made. Our packaging used to be made of transparent plastic. Now, however, you might be lucky enough to have a bag with a picture of one of the Olympic champions on it or the new Mademoiselle saddle. It all depends on which tarpaulin has been used. 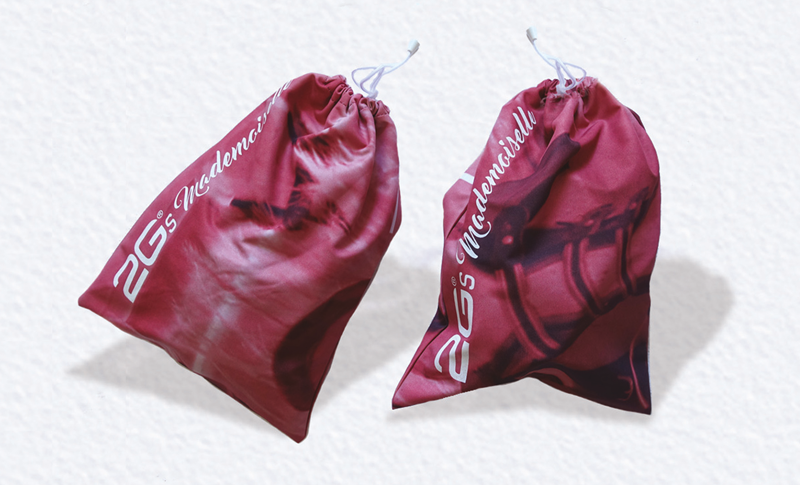 Look after it carefully, for some of these bags are bound to become collectors’ items !